Serving greater Pittsburgh and Western PA communities, including Bethel Park, Upper St Clair, Mount Lebanon, Monroeville, Washington, Murrysville, Shaler Township, McMurray, Robinson Township, Coraopolis PA, Butler, New Castle, Mercer, Slippery Rock, Hermitage, Franklin, Kittanning, Indiana and much more. Call the Pittsburgh gutter guard pros from Gutter Helmet by Harry Helmet® . Our local Pittsburgh gutter professionals can install Gutter Helmet® gutter guards over your new or existing gutters. With Gutter Helmet®, you will never have to climb a rickety ladder to clean your gutters again. And you won’t have to worry about ice dams caused by clogged gutters, which can damage and even destroy your home’s rain gutters. 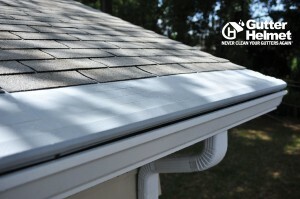 Gutter Helmet® guarantees to keep your rain gutters free flowing at all times, giving you year round gutter protection. Our professionally certified team of installers have performed thousands of new gutter and gutter guard installations throughout Western Pennsylvania for more than 34 years. We have thousands of satisfied customers. See what some of them have to say. Read some gutter guard reviews. Learn how Gutter Helmet® works. And then contact us for a free estimate. Don’t settle for the imitators or off-the-shelf gutter protection product like filters and mesh products. Gutter Helmet® is the first, the best and the #1 gutter guard solution for Pittsburgh homes. Gutter Helmet® Pittsburgh serves the greater Pittsburgh communities, including Butler, Morgantown WV, Greensburg, Washington, Uniontown, and Aliquippa.